ABA President Robert Grey speaking at the 2004 Judicial Excellence for Colorado Dinner. CJI welcomes ABA President as speaker. “Injustice anywhere is a threat to justice everywhere” Martin Luther King, Jr. This kind of sentiment has led many people to become lawyers; at the Hyatt Regency in Denver, three hundred and fifty of these people gathered to honor their finest. Represented at the event were some of the leading firms in Colorado; Holme Roberts & Owen, Holland & Hart, Patten, MacPhee & Associates, Wheeler Trigg & Kennedy and Haddon, Morgan, Mueller, Jordan, Mackey & Forman just to name a very few. Quieting a room full of lawyers is no small task, but Board Chair Richard L. Gabriel managed it in a calm and jovial manner and soon the proceedings were underway. Richard welcomed the guest of CJI and reminded them that their attendance benefited the CJI Judicial Education Preservation Fund, which supports the education of judicial and court personnel. Lawyer Gabriel also encouraged the attendees to read the material at each place setting which reported the mission, goals and current projects of the Colorado Judicial Institute. Richard asked, first the board of CJI, then the event committee for the dinner to rise and receive grateful applause. Richard specifically mentioned the work of Connie Talmage and the countless hours of work by Dana Nelson. In introducing Bertha Lynn, Richard said “our Emcee is a Denver institution; we have all been watching her for many years now, which is amazing because she is only twenty-five years old”, after laughter and applause, Richard continued “its particularly meaningful because her husband is one of Denver’s leading jurists, ladies and gentlemen, Emmy Award winning news Anchor Bertha Lynn”. Bertha, marked her second appearance as Emcee for the CJI Dinner, and with a smile, said she felt more comfortable this year in a room full of lawyers and judges, again without her husband, District Judge Larry Naves present. Bertha praised the goals of CJI, which include “Preserve the principles and concepts upon which our judicial system is founded”. Ms. Lynn also recognized the title sponsor of the evening Holme Roberts & Owen and thanked Primo Vino, Synergy Fine Wines and Montage Cellars for providing “the wonderful wines we have at all of our tables”. Bertha took a moment to recognize some of the notable jurists present, including Chief Justice Mary Mullarkey, the Honorable Luis Rovira and Honorable Anthony Vollack, before enjoining everyone to enjoy their meal. After the gourmet meal prepared by Chef Todd Maclay of the Hyatt Regency, Bertha invited CJI Board members Connie Talmage and Ralph G. Torres to the stage to present the awards. First to receive the 2004 Judicial Excellence Award - Magistrate Clinton A. Smith of the 10th Judicial District-Pueblo County. Among his many accomplishments Magistrate Smith, who was appointed to the bench in 2000, serves on the Juvenile Probation Services Committee. Judge Smith worked for the Pueblo DA for seven years and in private practice for twenty years and has been married to his wife Karen for 25 years. Next on the docket, County Court Judge Honorable Roy G. Olson Jr. of the Jefferson County Court. Appointed in 1980, Judge Olson is a member of the District Attorney’s Task Force on Domestic Violence and participates in the high school “Moot Court Competitions”. For over thirty years Judge Olson has been associated with the Forest Heights Lodge, an Evergreen-based treatment center for emotionally disturbed children and adolescents. Last to receive the Judicial Excellence Award, District Court Judge Honorable Cheryl L. Post appointed in 1993 and currently the Deputy Chief Judge in the 18th Judicial District-Arapahoe County. Judge Post serves as Vice Chair of the Statewide Caseflow Leadership Taskforce and as Judicial Liaison to the Office of Child Representative. Among her many awards Judge Post has received the “Distinguished Jurist Award” from the American Academy of Matrimonial Layers and the “Raymond Frenchmore” Award for Outstanding Contributions to Juvenile Justice. 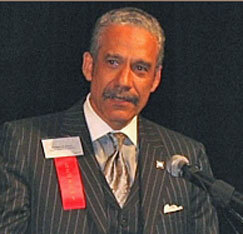 Richard Gabriel returned to the stage to introduce keynote speaker Robert J. Grey Jr. President of the American Bar Association, partner at Hunton & Williams of Richmond Va., past chair of the Commission on Opportunities for Minorities, and the Virginia delegation to the ABA House of Delegates from 1994-1998. Mr. Grey began by voicing his gratitude to be invited to speak and share the evening with Chief Justices Rovira and Vollack. In a slow rich voice he said, “Honoring Magistrate Smith, Judge Olson and Judge Post, speaks volumes of the quality and caliber of the individuals who are part of your judiciary”. Mr. Grey mentioned his friends, Judges, Karen Mathis and Fred Rodgers and hinted that the first president of the ABA from Colorado is on the horizon. Mr. Grey spoke passionately about the American Jury Project he said, “Ladies and gentleman it” speaking of the jury system, “is the cornerstone of our legal system it is the bedrock of our democracy”. Richard Gabriel closed the event by thanking Robert Grey for his very inspirational words and thanking all those who support the judicial system and work to make it better. Gold Sponsors Haddon, Morgan, Mueller, Jordan, Mackey & Foreman, P.C. Wheeler Trigg & Kennedy, P.C. Issacson, Rosenbaum, Woods & Levy, P.C.